Sleep through the night. Again. How will you enjoy your vacation with your little ones without needing another one when you get home? In this blog post we will cover it all: What to Bring, impromptu vacation schedules, sleeping arrangements, and and exactly how to recover lost sleep from your vacation when you come back home! So let’s dive into: How to Sleep While on Vacation with Baby or Toddler: Must Pack Items, Regressions, and Flying. Sleep and the City: Certified and professional help with baby and toddler sleep for ages 0-6. Sleep through the night, again! 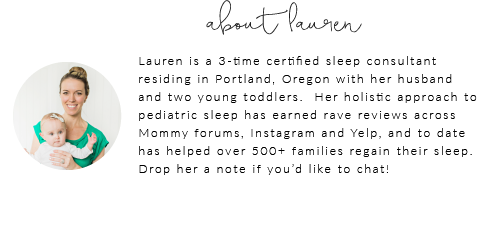 Lauren is a 3-time certified pediatric sleep consultant residing in Portland, Oregon with her husband and two young toddlers. Her holistic and modern approaches to baby sleep have earned rave reviews across Mommy forums, Instagram and Yelp, and to date has helped over 3,000+ families regain their sleep. Drop her a note if you’d like to chat! The 2019 Best Baby Names: Girls, Boys, French, Southern, Unique, and gender neutral/unisex names! Pacifier Weaning: When is the Best Age to Wean or Take Away the Pacifier from Baby or Toddler?